There are a large number of forts scattered across India. Over the past month I seem to have written about a number of them and now I find there is one more fort that needs to be written about. 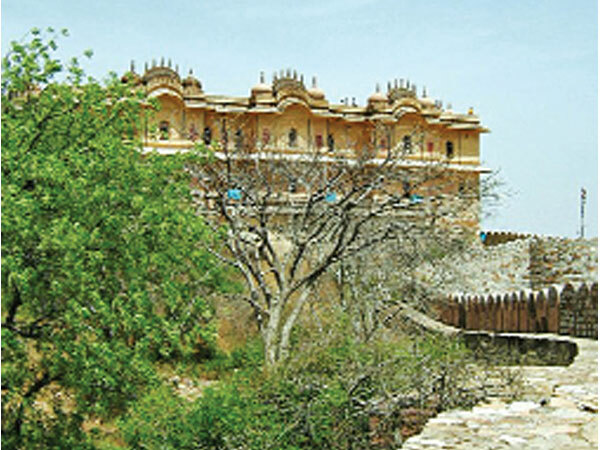 The Nahargarh Fort at Jaipur has just donned the garb of a Sculpture Park — and that too, the first in India! The most interesting part is the coming together of the past and the present with a Sculpture Park in this splendid Palace. The Sculpture Park was formally launched on 10 December 2017, by the Chief Minister of Rajasthan Vasundhara Raje who stressed on the fact that it was made possible by a unique collaboration between the Government of Rajasthan, Saat Saath Arts and a number of corporate sponsors. Nahargarh Fort, is located on the opposite side of the same hillock as the more famous Amer Fort. Overlooking the city of Jaipur, The fort, which dates back to mid-18th century, will now have a Sculpture Park to add to its popularity. Strictly speaking, it is the Madhavendra Bhawan Palace that lies within the Fort that is the backdrop for the work of a group of modern sculptors from India and abroad. The palace was built at the end of the 19th century by Sawai Madho Singh and is the best preserved part of the fort. Created as a pleasure retreat, Madho Singh had built one large suite for himself and six suites for his queens, creating an intriguing network of rooms, corridors and staircases, with delicate frescoes on its walls. Now transformed into an art gallery and India’s first contemporary sculpture park, the palace now exhibits a range of top Indian and international contemporary artists, both in and outdoors — with artworks all made of hardy material such as bronze, stone and wood. The pieces have been carefully and sensitively installed to ensure that no damage is made to any surface of the heritage palace. Curated by Peter Nagy, a group of known artists have put together an interesting exhibition combining sculpture practices of today. The varied subjects and styles have found a place here, created by sculptors from India as well known international names. The park’s first exhibition includes artworks by 15 Indian and 9 international artists. Among the more interesting pieces are Benitha Percival’s poignant installation of three figures titled Let Them Have Their Land, L N Tallur’s Intolerance, Subodh Gupta’s Stove and a bust of Gandhiji on one of Thukral & Tagra’s special tables, titled Memorial. Other artists participating in the exhibition are Mrinalini Mukherjee, Jitish Kallat, Bharti Kher, Arman, Huma Bhabha, Anita Dube, Vibha Galhotra, Vikram Goyal, Reena Saini Kallat, Manish Nai, Gyan Panchal, Prashant Pandey, Ravinder Reddy, James Brown , Stephen Cox, Evan Holloway, Matthew Day Jackson, Hans Josephsohn and Asim Waqif. At the opening ceremony, there were a number of important messages from those involved. Shreyasi Goenka, Co-Director Saat Saath Arts added, “The Sculpture Park at Madhavendra Palace, Nahargarh Fort, Jaipur will be the first of its kind where an Indian state has collaborated with a non-profit organisation to support contemporary art. We are thankful to the Government of Rajasthan for this alliance and are certain that it will set a great example on how imperative public-private partnerships are in the promotion of public art. Visitors to Jaipur, will now have to add one more must-see tick on their list.